Bacon BBQ Meatloaf Burger - Home. Made. Interest. Thank you to Lipton for sponsoring this post! All opinions are 100% mine. Has everyone been enjoying the last few weeks of summer? Last week the kids started school so it’s been pretty crazy while we’ve struggled to get back into the swing of things. My son is just starting first grade and my daughter is in preschool so by the end of the week we were all tired and in the need of a little fun with friends. The weather here in Maryland is still warm and sunny and I’m doing my best to soak up every last bit of summer sunshine before fall sets in so I really wanted to grill out, and the kids were missing the friends we’ve been hanging out with all summer, so I made a few phone calls and fired up the grill for a last minute cookout! I love small, spontaneous get-togethers like this because I get to have a little fun with my recipes without having to worry about cooking for a big crowd. I’d been wanting to try out a new burger recipe for awhile and they all agreed to be my guinea pigs. The thing I love about meatloaf is making a meatloaf sandwich out of it the next day. The meat is tender and it is so good sandwiched between two slices of bread with a little mustard. I put a fun twist on that classic meatloaf by turning it into a burger. The burger patty is made with a traditional meatloaf mixture and then, instead of the usual ketchup topping I basted the meat with BBQ sauce while it cooked on the grill. I say I did it but really I let my hubby do the grilling. I did come up with the recipe after all! 😉 While he manned the grill I got the drinks and a few snacks ready. 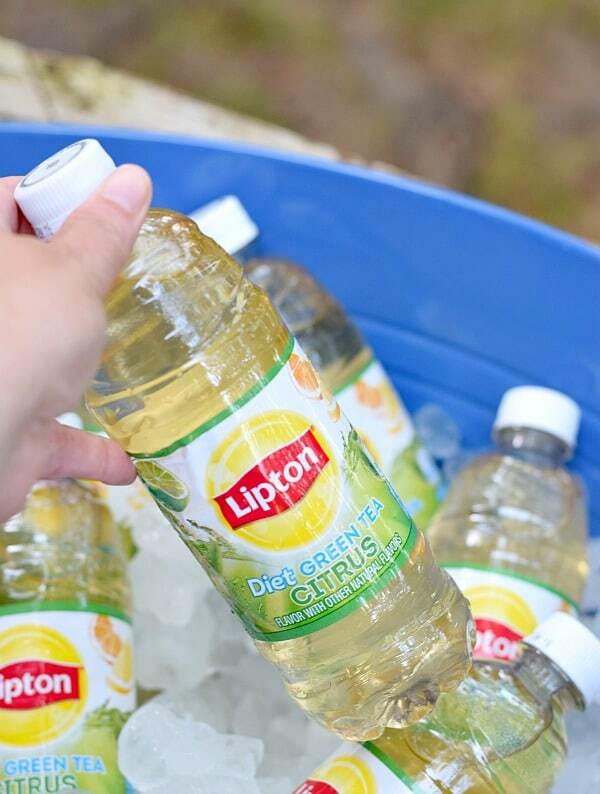 Since we’re celebrating the end of summer I threw some bottled Lipton Diet Green Tea Citrus flavor into a cooler and we all sat out on the deck watching the kids play together while my husband basted away. I don’t know what it is but iced tea totally makes my meal when it comes to summer cookouts. Nothing says summer more than sitting outside with a cold bottle of Lipton Iced Tea soaking up the sunshine. 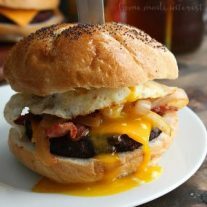 When the burgers were ready I took the adult version to a whole new level with crispy bacon and a fried egg on top. OMG guys, we’re talking gourmet comfort food here. The meatloaf, BBQ sauce, and bacon were covered with that runny egg yolk and the burger bun soaked up all of the juices. It was amazing! Add a bottle of Lipton Iced Tea and you have the perfect end of summer meal. I may never go back to plain old meatloaf :). Everyone loved the burgers and we all sat around enjoying each others company until well after dark. Spending time with friends was just what we all needed after a busy week. We’ve got at least a few more weekends of summer grilling left to go so I can’t wait to do it again! A grilled twist on a classic comfort food! Combine ground beef, sour cream, panko breadcrumbs , salt and pepper in a bowl. Form ground beef mixture into 4 burger patties. Saute onions until brown. 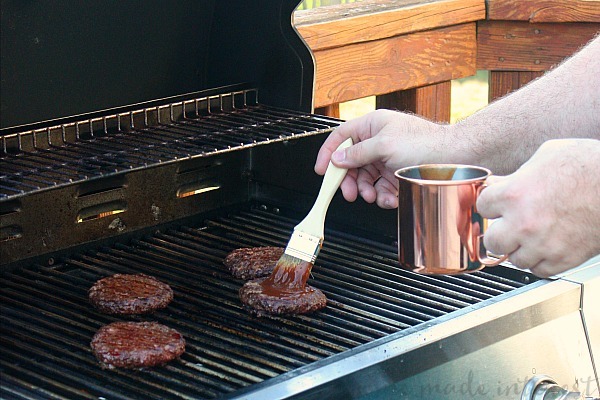 Add 1/4 cup BBQ sauce at the last minute cooking for an additional 1 minute. Set to side. Grill burgers basting with remaining 1/4 cup BBQ sauce as they cook. 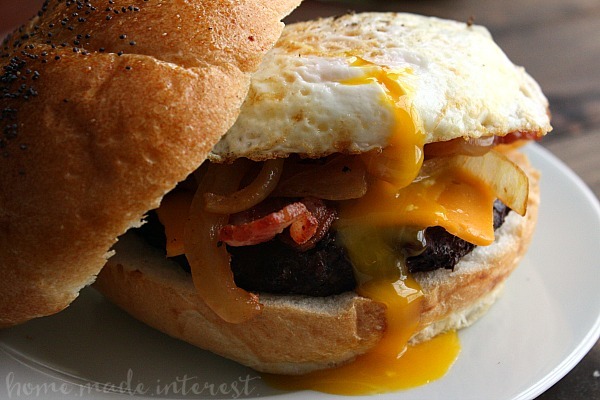 Place burger patty, bacon, and fried egg on a bun and enjoy! Check out Lipton Bright Bites for more creative twists for summer meals! « Previous PostSeptember Meal Plan – Tailgating Recipes ! I’ll be right over for lunch! Oh my gosh these meatloaf burgers look and sound amazing. Can’t wait to try them. Pinned! Okay, this is like all of my favorite things in burger form and I could not be more excited about it. I am OBSESSED! This just made me crave a bite of the burger??? ?